In my Last Post I talked about ditching Interactve Notebooks in favor of binders and Cornell Notes. I used to be a teacher who cringed at the thought of using binders at all. Notebooks seemed so much... neater. Until you factor in all of the glue that you have to use. Do you know how many pages in a composition notebook can become stuck together if you use enough glue? The answer is ...all of them. All the pages. So when I began my mission to end my relationship with Interactive Notebooks, I knew that I had to have something more effective and time-efficient to replace them. Part of my school's School Improvement Plan the last several years has included the use of Cornell Notes, and I have seen some classrooms that use them, and it was lost on me what was so terrific about them. What I saw was teachers handing students printed sheets with questions in the left column, and lines on the right for them to answer the questions. These are text-based questions, so students have to essentially hunt for the answers in the book. How in the world can I teach concepts related to my ELA classroom this way? There certainly is a lot of room in the Language Arts classroom for students to answer text-based questions, but that is only one part of the equation! How can I provide my students with effective notes on the big concepts - theme, central idea, context clues, word parts...? There had to be more to Cornell Notes than simply reformatting the question-and-answer-from-the-text snoozefest of yesteryear. It turns out, Cornell Notes are actually totally awesome! Once I realized how they worked, I was hooked! I started creating one-pagers for all of our Florida ELA Standards right away. Cornell Notes pages are divided into three sections. There is a left-hand column, a slightly larger right-hand column, and a section along the bottom of the page. I created a template for this (seen to the left) which you can download here (for free) that also includes a section at the top for students to include the Standards/Learning Targets/Goals/Objectives/Essential Questions. The left-hand column is intended to be a "cue column." This section should include vocabulary terms, key words and phrases, and potential exam questions (this is my favorite one! Using question-stems, you can provide students with sample questions that might mirror what they'd see on a state exam! This can be helpful when having students dissect questions in prep for testing - I wrote a post about this last week!) Essentially, this column would contain the "what," "who," "when," and "where" information. The right-hand column is the note-taking column. This is where students take notes during a lesson or in-class. In this section students would include the main points, graphs, charts, bullet points, etc. This section is where the "meat" of the lesson would go. The bottom section is for summarizing after the lesson is complete. This is a sort of student reflection zone where they can sum up the lesson in their own words. This process helps solidify their understanding of the concepts. In my classroom, I provide students with the left and right-hand column information during a lesson because 7th graders haven't acquired the skills to effectively take their own notes, however, the summary box at the bottom is their responsibility after a lesson is over. This can be a home work assignment, an exit-slip assignment, or just something they do in the last 10 minutes of a class period. By practicing the process of taking Cornell Notes with good models, students will learn what good notes should look like and they will be familiar with the process for the future. Encourage students to draw diagrams or pictures to represent their notes. Encourage them to use different colors and to be creative Cornell Notes don't have to be rigid and boring! At the beginning of each lesson, we create a Cornell Notes page. These should be no more than one page! Be succinct. If you try to give students multiple pages of notes at once, you will lost their attention completely. Students put their Cornell Notes pages in a sleeve protector that serves as the section divider for that particular standard or skill. Any work/questions/articles/etc. that I pair with that lesson goes behind that Cornell Notes page to serve as examples of how that skill is used. Many standards have to be broken down into multiple skills, so one standard may have multiple Cornell Notes pages, but of course, you would not teach Chronological Order and Compare and Contrast in the same day or at the same time, even though they both sit under the umbrella of "text structures" within the standards. In fact, I have found that chunking content is much easier when using Cornell Notes and standards can be broken down better into individual skills/components. Below are photos of some of the Cornell Notes pages that I have created this spring for the standards that I use in my classroom. These are an upgrade from my original ones, but as I get better at using Cornell Notes myself, my own notes get better. These are one-pagers that include the standard and skill at the top of each page and my own summary at the bottom. When students are learning how to take Cornell Notes, I show them my own summary as a model until they are more comfortable with the process of summarizing their own notes. Eventually, students should be able to complete their own summaries from the notes that they are given. 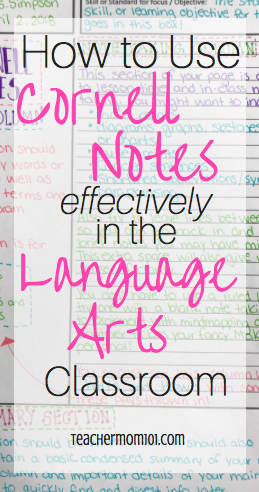 Also, you can read my latest post about how I differentiate using Cornell Notes! You can now get a copy of my Cornell Notes in a full, typed, ready-to-print document that covers every ELA standard, including writing and grammar. This also includes a student fill-in-the-blank page! This is available on this post! What size of binder do the students use? A 1.5 inch binder has been perfect. We don’t put everything in them, just things that exemplify standards and can be used as reference to study or complete assignments. The page protectors, do your students buy them or do you? Your notes are gorgeous! How do the kids' look? Are they able to keep things that neat? I have 6th grade sped students and I think these look fabulous but I'm not sure they could keep it that neat. I use a cloze version of my Cornel Notes for my SPED students. I just copy my notes, white out key words then make enough copies for the SPED students in my class. When we take notes in class, the gen ed students write everything on their own and the SPED students fill in the blanks on their copies. Theora I love the differentiation! That's a wonderful idea. I give my special ed students an overview, and we annotate directly on the pages in much the same way as these Cornell notes (but more random). Do you have a ppt that you used to teach the initial skill of Cornell notes that you wouldn’t mind sharing? Thank you for posting all of this information on Cornell Notes. I am in planning mode for next year and this has completely changed the way I want to structure my 7th grade ELA instruction for next year. The pictures are fantastic! Thank you again. No problem! I'm so ghat that this is helpful for others! I'm a 7th grade ELA/Social Studies teacher and I'm loving this idea! I integrate my subjects and my brain is full of ideas to implement this information on Cornell Notes! Thank you for posting examples of your notes. They are very helpful. Awesome! I am so glad that this is helpful fo others! I found this last night, and am currently sitting with my ELA 8th grade PLC (also here in FL) sharing this gold-mine! We LOVE that you created your notes BY STANDARD! Would you mind sharing any other standards you have created notes for? Our school is an AVID school, so we are familiar with Cornell Notes, but your notes are SO BEAUTIFUL, we'd love to see what else you have created. Thanks in advance! If you don't mind sharing, what county are you in? I'm in Collier. Apparently we are going to be moving to AVID soon - the trainings have started. It was important for me to have notes organied by standard and even by the skills within each standard. I'll take some photos of my mother notes - do you have na email address I can send them to? I'm so glad this was helpful or your team! We're right over in Pasco County! Thank you so much for your help! Can you believe we're planning for next year already? My email is catbarlo@pasco.k12.fl.us Thank you! I am in AZ and would like to incorporate these notes with my 6th grade ELA and possibly my 5th grade ELA. Do you mind sending me the notes? lfrazier@nadaburgsd.org. I will be sharing this idea during our beginning of the year PLCs. Another question... Do you have multiple classes? When you model for the multiple classes, do you start a new model of the same notes or project the notes from another class? Also, I do have multiple classes. I only have 1 page of notes and I use that for every class. I just cover the page with a blank sheet of paper to cover the notes we haven't gotten to yet. This way it doesn't matter where each class stops or what pace we are moving at! May I be a part of this email sharing... I am new to 7th and 8th grade ELA and I want to utilize the cornell note taking methods you have shown in here. I love them! It was like your pintrest was sent to me by a higher power...I dreaded using the interactive notebook and had completely forgotten about Cornell notes. I was familiar with them when I taught high school but had not thought to use them with 7th graders. I love how you have broken them down by standard which seems so logical. If you do not mind sharing your notes, I would love to introduce your suggestion to the other teachers at my school. My email address is tammy.holdip@cobbk12.org. This just seems so logical. Thanks. I love the simplicity of this and how it is so tangible to students. Would love to begin creating this for next year. Did you have a resource that you used to help you create your teaching notes? How did you create notes that were effective, complete, but not overwhelming? Wow, could I see your scales as well? Hi. I just happened to be browsing and found your great idea using Cornell Notes. I have been looking for something different to do in my 6th grade ELA class. I do use Cornell Notes in my history class using questions from the chapter.. This idea is awesome. Could you please send me the scales as well? Thank you. Two other questions. Do you share your notes with students and they write what you've written as you discuss? How often would you introduce a new standard/one pager? Some students copy my notes while we discuss, others have notes that are partially filled-in. I have SPED students, so differnetiating this is essential. At the beginning of the year, I introduce a new standard every week or two weeks. They only take notes on the standard once throughout the year. When we re-visit a standard, we simply review the notes that we previously took! I have 4th grade math. I would like to use this but my kids tend to write very large. Do you think 2 pages facing each other would work? Also is it in marker? I prefer marker but assume it would bleed. I think that 2 pges facing each other would work perfectly! I use felt-tip pens, not markers. They tend to belld through the pages less! I currently teach 7th ELA in Texas. My campus implemented Avid last year. Cornell Notes is a large component of their course but I'm not too savvy with it. I get the basic concept now that I've read your article and I really like how you've given some of your samples. Would you be willing to share the rest? Absolutely! What is your email address? I am with you on the trashed 3-ring binders. My students keep them in the classroom. I buy cardboard magazine boxes (in my "shop my classroom" section, you can find the ones that I buy from Ikea, they are super cheap) and then I cut the front off of the boxes so that the binders just slide in. So each student has a box for their binder and they don't get trashed! Hi Kailey. I am in love with these notes. We too tried our hand at interactive notebooks and have been searching for another option. I teach 8th grade language arts. I was wondering if you could share any other samples you have. My email address is sstull@wvwsd.org. Thanks in advance and for this idea! I included links to all of my Cornell Notes pages in an edit of this post! We do the left-hand side together because it includes academic vocabulary, and then as we work through the lesson we do the right-hand side, and then add things to the left side as-needed. How would you handle this for multiple classes? I only have 1 page or copy of my own notes that I would show students. I put that page under the doc cam and use blank pages to cover whatever we haven't gotten to yet. So my notes are ready to go no matter which class I am teaching. Kaily, I teach 9th grade ELA in TN. Would you please email me your sample pages, so I can share your idea on Cornell Notes with my academic team? I believe this would work wonderfully with our standards,too. Good luck teaching 7th and 8th! Middle schoolers are a mixed bag of fun and frustration :) Typically I begin with notes to discuss vocabulary, give examples, and discuss the big concepts. Then we use a mentor text and "I do, you do we do" to highlight those concepts, and then students use a diferent text to practice. Depending on the skill, this can take a few days to a week. Ohmygosh! I spent SO much money on interactive notebook materials through TPT and I gave it up, too. It was WAY too little bang for the buck. One of the things that is going round and round in my head is my use of Scope Magazine skills pages. There are usually multiple standards in an assignment. I'm wondering how you've dealt with this in the binders. I'll be sure to leave good feedback for you on TPT. I especially like your font. :) Thanks again! Awesome! i am so glad that those resources were helpful for you! I organize my binder by standard. Each section begins with a Cornell Notes page that we put in a sleeve protector, and then we use a post-it as a "tab" so that page acts as the placeholder for that standard for easy finding. Then any graphic organizers go behind that, and any mentor texts. I use all kinds of diferent resources to find mentor texts and I photocopy or copy & paste into a word documnt so that every student has a copy of whatever it is. I hate "don't write on these" copies. Every student should have one that they can write on! Great post - awesome job! I will email you my samples! I think that 3rd grade is an excellent starting place for Cornell Notes. If they master this before Middle School, they will be taking their own notes without a mentor copy and that would truly be beneficial to them later in their education! Yes! All of the glue! I didn't use a singe glue stick after i ditched interactive notebooks. In fact, I donated all of my glue to the math department for a project that they were doing. It was a weight off of my shoulders! I will email you my examples! I teach 7th ELA and have used IN for years. Would love to know the implementation process and is the binder the only supply students need? Students need a 1 1/2 inch binder and I use sleeve protectors. We put the Cornell Notes page for each standard in a sleeve protector and then use a post-it to make a "tab" that labels that section by standard, so it acts as a sort of divider for easy finding of that standard. I buy sleeve protectors in big boxes for under $5 at Costco. Other than that, it's just a matter of making copies of mentor texts and graphic organizers. Significantly less materials than interactive notebooks! I can't seem to find sheet protectors for a decent price. Have you bought them recently at Costco? How many do you get for $5? I bought a box at Costco about 2 weeks ago for around $5. I think it was like $4.98. There are 250 in the box and they are the heavy duty ones, so they are nice and thick! This! I’m moving to 7th Grade ELA next school year, from 6th, and I wasn’t sure about how to implement INBs. On our campus we were forced to use them. However, we are an AVID campus so Cornell notes are not new to me. I do LOVE the way you’re tweaked them. My students always had the hardest time coming up with questions for the left-hand side. Your use of the left-hand side is more beneficial to the student. I’m totally ditching INBs and using a binder next year. Thanks for all the photos 😍. I attempted to download the template you provided but it did not work. the left-hand side needed to be more structured for my students, they don't really know how to come up with their own questions yet, which is why I decided to utilize it the way that I did! Interested in seeing how you implement the writing standards with the Cornell note taking strategy. I would like to see any examples you have. Love your concept! Bravo!! There is a link in this post to the documents in my google drive that contain all of my master copies! I am so glad that you found this helpful! I will email you my master copy links and the Marzano scales! Kaliyah, I wish I taught with you! Would you be willing to share the marzano scales and master copy links to me? I teach 7th grade ELA. Also, how can I subscribe to your blog? My email address is svenderley@gjcs.k12.in.us. I will email you the Marzano scales! These are fabulous!! I would love to see/ have copies of all that you've done. Do you have them available on tpt or anywhere else for sale? There are links in this post to the files that I uploaded to my Google Drive that contain all of my master copies! Question for you though, if you don't mind - I teach 6th grade SS and would love to implement Cornell Notes in my classes but often our notes are lengthy. 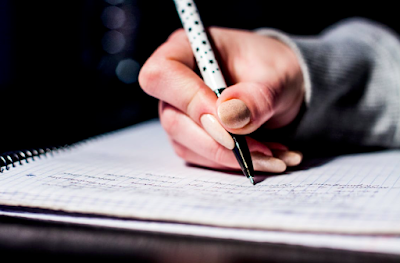 Do you find your students needing multiple pages of Cornell notes on one topic? Or do you just cut down the notes you give significantly so that it will all fit on one page? If that makes sense...thanks for your template too! Cornell Notes can be multiple pages of it is necessary! I agree that SS has a significantly higher number of notes than ELA, so I could definitely see using more than one page. Maybe back to back? I would just recomend sticking to one idea or concept per note-taking session, actually, I have found that this has helped me chunk the content for my students better! Yes! Cornell Notes can be used at any age and if they need multiple pages, or bigger spaces to write in then it could totally work! I think that getting kids started with notetaking skills in elementary school would help them so much in the future, and your secondary teachers will thank you! Yes! I will email you the scales and links to my sample pages. I am so glad that this was helpful for you! I will be emailing you today! I'm a 5th and 6th Reading teacher. I too dumped my INB in the middle of last year. Too time consuming. I would love a copy or samples of your notes, please! Hi Michelle! Your email was returned to me, is it maybe not typed correctly? Let me know and I will resend it! Thanks! Hello! I am very intrigued by this method and I teach 5th grade ELA/SS in Alabama and I integrate them. We have no ELA textbook or resource other than the standards. This seems like an amazing way to sort of create our own "textbook" resource in our binder. Your examples show a lot of amazing flair pen color. :-) Do you run your notes in color for your students? You mentioned you give note pages with both right and left side completed by you, and students fill in summary. Do they get to use colored pens? Also, do you eventually release more responsibility for them to complete the notes? Regarding your SPED cloze notes, would it be possible to see a note sheet that you give your reg. ed students and then the same sheet with how you've modified for your SPED students. I would live to see a beginning/middle/and end of year set of notes to demonstrate progression for me. Thank you so much!!! I am very excited to try this next year! My email is Hstrickland@auburnschools.org . I know I have asked for so much! I will email you my master copies, but to answer your questions - most of my students get a blank Cornell Notes sheet. I put my copy under my Document Camera so that they can see my notes and I discuss as they copy. For certain students in my ESL and SPED classes, I give them a version of the notes page that has a lot of the notes filled in already, and they just have to follow along and fill in the blanks on their notes. I do start with the left-hand side and cover the right with a sheet of blank paper. We discuss vocabulary before getting into the meat of the lesson. Later, I incorporate other vocabulary activities, but for the purpose of having these intheir notes, this is where we start. To begin the year, I do show them my entire notes page including the summary part. As the year progresses, I do begin to release the summary portion to them. The time frame on this depends on the class. Sometimes it clicks fairly quickly, and other classes require more guidance. I am so glad I came across this last night! I will be teaching 7th and 8th grade ELAR for the first time in 4 years. I feel like this will benefit my kiddos tremendously! I've tried interactive notebooks, but usually dismiss them about half way through the first semester. Would you mind sending me copies of your other examples? And maybe an example of how you do the cloze notes? I'd like to make a plan for next year while I'm still on summer break :) My email is memoreno@irvingisd.net Thanks for your fantastic ideas!! Could you please share your other samples and any resources you may have . I have decided to not use interactive notebooks this year and look forward to implementing Cornell Notes in my 6th grade ELA classroom . Oh my gosh, I'm so relieved to discover that I'm not alone in my frustration with Interactive Notebooks majoring on tons of glue & paper & minoring in engaged student learning! I've heard of Cornell notes but not seen examples of these in use--thank you for sharing. I'm a 4th grade teacher at a school using Marzano & Jay McTigh Backwards Design Instruction. Would you be willing to share your examples with me? My school email is jenise.jackson@humboldtunified.com Thank you for helping me become excited about the new year ahead! I love this idea! I've been doing a lot of research on interactive notebooks, but I like this better. Could you send me a link to more examples or how you came up with the information in the notes? Thank you for your willingness to share with other teachers. I teach 6th and 7th grade ELA in Michigan. We are an AVID school and use Cornell notes as well. Yours are awesome! Could you share some more examples of how you do the Cornell notes on the standard break down? I love this! It would really help the students and teachers know exactly what to teach within the standard. Thank you in advance for any help you can offer. Thank you so much!!! You have helped me out so much! Very much appreciated. Hi Kaily! I too teach 7th graders and I LOVE, LOVE, LOVE this!!!! I have been researching the best way to organize student materials and teach note taking skills. This has both ideas in one! Is there a place or way you would be willing to share what a completed notebook looks like? How do you tab or easily find each section? Hello, Kaily, and thank you so much for sharing. I too am pretty much over the cutting and pasting for INBs and would love to see any other examples you have of your Cornell Notes. I teach 7th grade in Okaloosa County, Florida. Appreciate you! Also, if you email me at kailysimpson@gmail.com I will get back to you with my other examples! I have attended many AVID trainings and I must say, you nailed Cornell Notes in an ELA class! I am moving from 6th grade ELA/SS up to 7/8 ELA. My class levels will range from RSP (SPED) through Jr. Scholars (Pre-AP). I never could fully wrap my head around interactive notebooks. The pages would tear out from being heavy with glue and added cutout paper. I switched to 3 ring binders a few years ago so that kids could add to different locations as needed. I would love if you would be willing to share your masters with me for the standards you have completed. Thank you so much for your willingness to share with all of us. Thanks so much for this info! Could you please send me the Marzano scales and your notes as well. Amandanickles3@gmail.com I’m starting a new position and would love to incorporate these into my classroom. This is so amazing, however, I have trouble creating my own standards pages because I overthink everything. Do you have any TPT information that I can download? Not just a template, but an example? Thanks! If you leave your email address I will email them to you! Phenomenal! I also teach ESL and ESE ELA in high school and tried IN and gave up in the middle . Your notes are amazing! Please share email me your current ones and the Marzano scales at cpmori@hotmail. Hope you get examples for each of the standards and get it on TPT ASAP-- you got yourself a winner!!!!! And congrats on your new sweet baby! Thank you! I have emailed you! I would love it if you can email me the standards pages for 7th grade....this is my first year teaching 7th!! lpenniston@dadeschools.net THANK YOU!!! Can you please email me anything to help me with 6th grade ELA? Sure! What's your email address? Our test scores have also not been the best and Cornell Notes seem like a great replacement for interactive notebooks. My students also would take a very long time with cutting and gluing, so would really to see how this goes instead. I teach 6th grade reading and language arts in Spanish and would also love to see the notes and scales. My email is pcocco@d45.org. Could you email me your notes pages? I love this resource? You need to set this up on Teacher Pay Teacher! Hello! I just found you on Pinterest and am so inspired. Could you share how you use Cornell Notes in the use of your stations? We take Cornell Notes when we start working with a new standard. When we review a previously touched on standard, we just review/use the notes to practice the skills. Students keep these in a binder in the classroom.